We are not currently breeding but look forward to answering your breed specific questions. 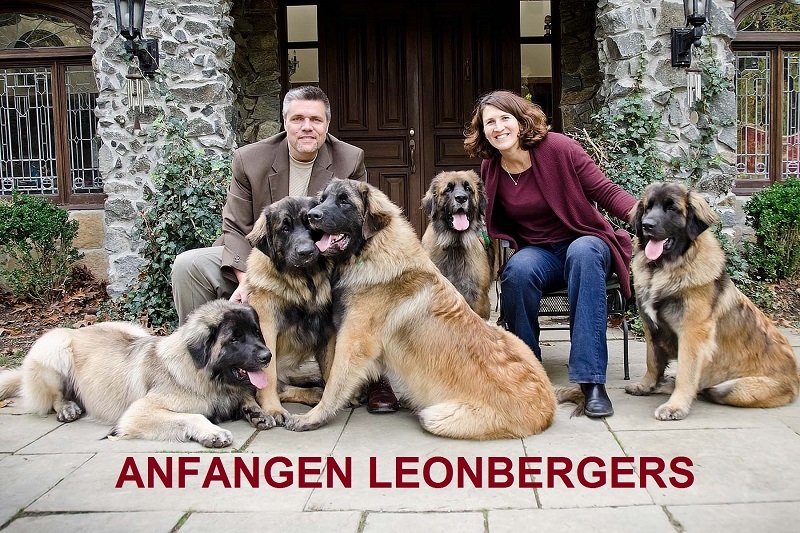 Thanks for visiting Anfangen Leonbergers located in beautiful Alexandria, Virginia. You may be wondering what “Anfangen” means. Frankly, it means “to begin” in the German language. 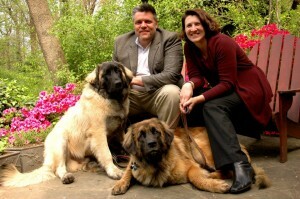 My wife and I felt it to be an appropriate moniker as we became the proud owners of two super Leonbergers – “Starhavens in the Ninth” and “DaVinci by Providence.” These two were the beginning for us on this great Leo-journey. 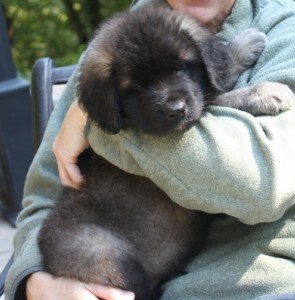 Anfangen Leonbergers came into being when Niner whelped 11 puppies in August 2012. The puppies from our first litter have been placed in great homes. 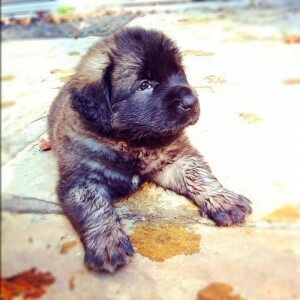 Yes, we remain in touch with all of the puppy owners and remain very proud of our first litter! Niner gave birth to her second litter in August 2013. 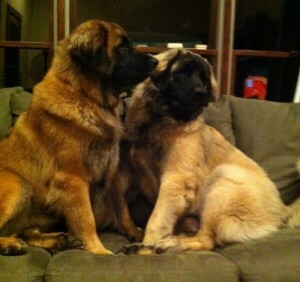 Those puppies were whelped by Agi Hejja at Starhavens Kennel in Richmond, Virginia. 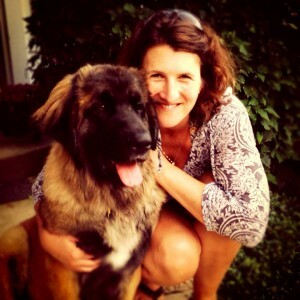 All of those pups have been placed with super families as well – both as pets and show dogs. In March of 2015, Niner provided 7 new puppies in the North Virginia blizzard. Those pups are aptly named after “Frozen” characters. Five came easily and the last two were born in the vet’s office only to be transported home inside the shirt of a willing owner to keep the pups warm! All seven have been placed and are doing fine! Today, both Niner and Vinny are AKC Champions with very strong CHIC (canine health information center) scores; Niner is a grand champion as a matter of fact but her breeding days are behind her. We are not considering any new litters at this time but we are anxious to stud Vinny (fawn colored Leo) and his son, Jarvis, also an AKC champion. Feel free to contact us. We love to hear about your family and why you want to own the oldest German breed in the world (yep, older than German shepherds!). 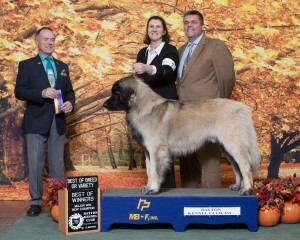 We love to meet prospective owners and discuss/show off our great breed. 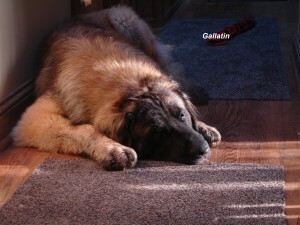 In 2010, we became interested in this statuesque but gentle breed and after visiting the Leesburg, Virginia dog show and meeting “Captain Jack,” who was showing that day. 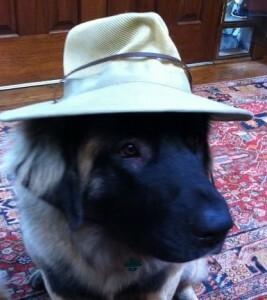 “Captain Jack” made us Leonberger-envious and we were in hot pursuit to become proud Leonberger owners. By February of 2011, we had our first Leo – “Starhavens in the Ninth,” (Niner) – and nine months later, we brought “DaVinci by Providence,” (Vinny) home to become part of our family. 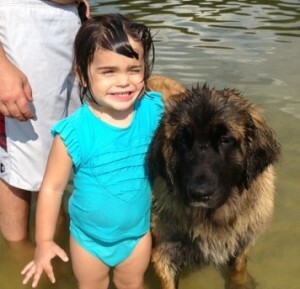 Fast forward to August of 2012 and we are now a kennel, have our two Leos and two of their puppies. “Niner” is now an AKC Grand Champion and Vinny is an AKC Champion. 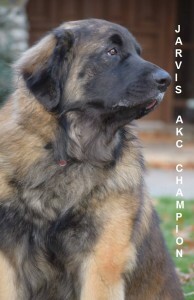 Jarvis from our “A” litter became an AKC Champion at approximately 14 months and his brother Berthoff is also an AKC champion; Berthoff lives in Maryland. 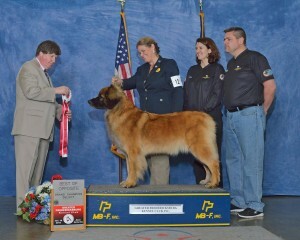 Niner’s second litter also brags one new AKC champion. 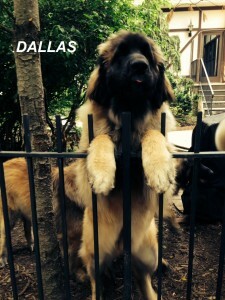 Anfangen Leonbergers is anxious to stud both Vinny and Jarvis, both AKC champions. However, we are not anticipating any new litters in the near future. We hope to see you at our next show.